I went to a family gathering yesterday and saw some cousins and aunts that I hadn't seen in quite a while. It was truly beautiful. 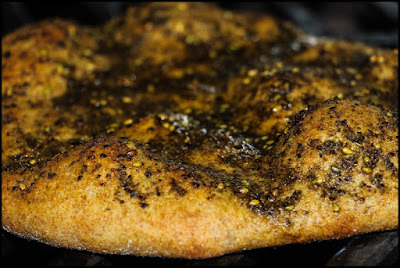 We all brought things to eat, and one of the things that I brought was za'atar bread. I don't make this that often but when I do I wonder to myself why I haven't made it in such a long time; it is so simple and delicious. 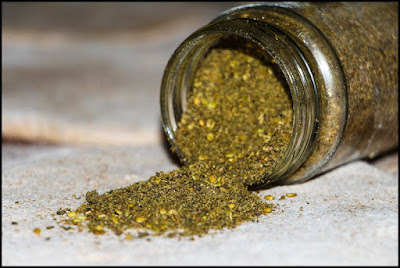 But before I talk about the actual recipe I suppose I should mention the herb blend itself. 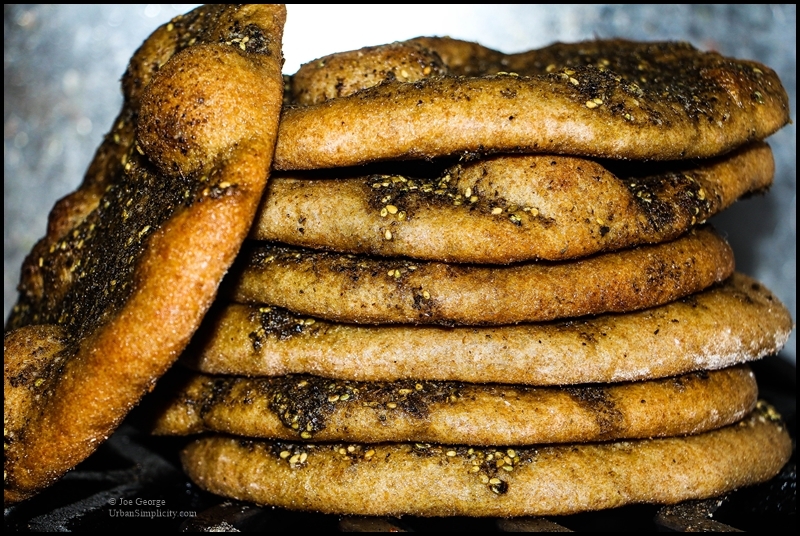 Za'atar is a common herb blend all over the Levant, but is particularly common in Lebanon. In it's most common form, it is comprised of thyme, sumac (which gives it it's distinctively slightly sour taste), toasted sesame seeds, and sea salt. But there are many variations; two of the more common also include oregano or cumin. It's usually readily available in any Middle Eastern market. If you are in the Buffalo area you can purchase it at Pete's Lebanese Bakery, Guercio's, or Penzy's on Elmwood. Or you can make your own. 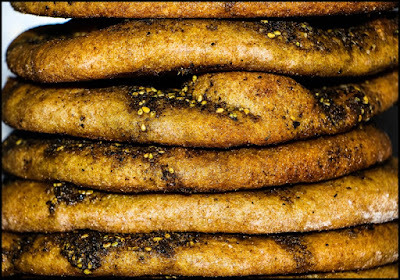 I'm told that in Lebanon this is eaten for breakfast, lunch, and dinner. And I can understand why...once you get a taste you'll know too. And as I mentioned, this is so easy to prepare. Normally this is not made with whole wheat dough, but I prefer most things whole wheat/grain these days. 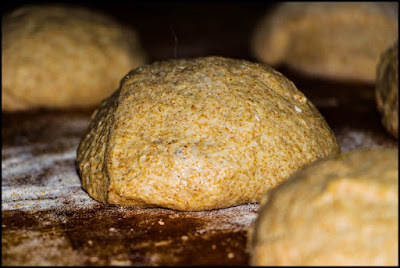 Anyhow, you can make your own dough as I did (use any of these super easy recipes), or a store-bought raw dough. After forming the dough into balls, the next step is to roll it out. 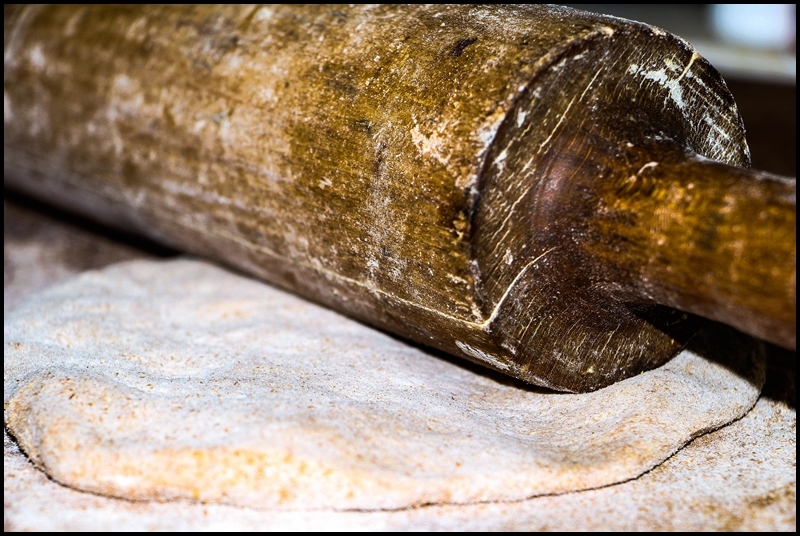 I used my siti's (grandmother's) rolling pin which I inherited from my aunt a few years ago. She told me it was from the "old country." Anyhow, roll the dough as large or small or as thick or thin as you like. I rolled these into discs about 8" wide by 1/4" thick. This was to be used to dip into hummus; if I was making it for sandwiches I would have rolled it much wider and paper thin. Next, drizzle the dough with olive oil and sprinkle a liberal amount of za'atar, and rub it into the dough with your fingers. After letting the discs rise for a few minutes, bake them--a few at a time--in a hot oven (425F) for about five minutes. 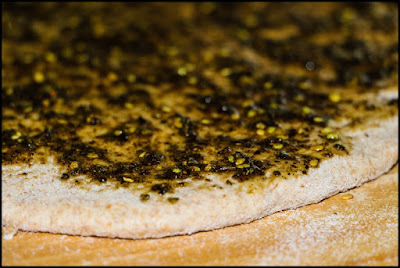 I have a pizza stone in my oven which I slide the dough onto. Lacking that, you can use an inverted baking sheet. Either way, it is essential that the oven be pre-heated and that the stone or tray are hot. Lastly, share the bread with friends and family. 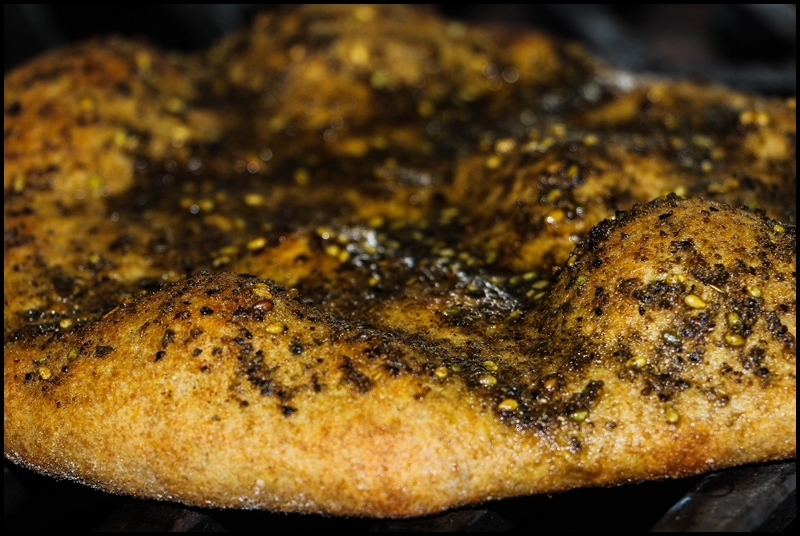 If you'd like additional Lebanese-inspired recipes, click here.